I write because I enjoy working with ideas. My mind is always active. I am always thinking about something. I like to consider how one idea is related to another and what impact that idea has in life. Stories which wrestle with deep questions fascinate me, even when I disagree with the author’s conclusions. Writing provides an outlet for these interests. I write because I enjoy writing. Writing is an opportunity to organize my thoughts and express them in a coherent manner. This allows me to share my thoughts with people, and it provides a helpful resource for me when I am dealing with the same issue again. I cannot count the times I have been aided in one project by going back to something I previously wrote. I write to break from the norm. At my current job it is all too common to see people looking at their phones during breaks. Sure, this is not universal. People also talk to each other, but the phones are always prominent for many people. When I am at work I may briefly check messages during breaks, but for the most part I try to set an example by devoting my break time to reading or writing (and when I write at work I use my notebook, not my phone). I write because I want a better life for myself. Before work I devote some time to reading an article relevant to my writing, whether it is about the craft of writing or research material related to a writing project. After work I devote some time to both reading and writing. It would be a dream come true, however, to devote myself fully to reading, research, and writing. I recently entered a short story in a writing competition, and I eagerly await the results. I was not good at fiction writing in school, but recently I have had some ideas. I was reluctant at first to pay the entry fee to enter the competition, but then I told myself that I needed to do it. I will tell you if I win anything. In the meantime I am working on a longer and more ambitious story. I write because the voices inside want to be heard. 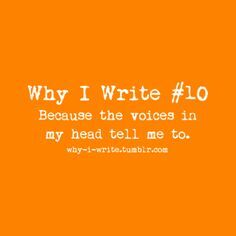 No, I do not really hear voices in my head. I do not sit at my computer and repeatedly write, “All work and no play makes Henry a dull boy.” I mean the thoughts and ideas in my head. The thoughts about life, the stories that could be both entertaining and thought-provoking. They are inside, and I want to bring them out. I write because it is what I am driven to do.